Today’s guest picture shows a very cool customer who turned up in my son Tony’s back garden yesterday. Tony was busy again today. I notice that he got out of the igloo before he let anyone stand on it. The snow was still here this morning in Langholm too. The wind had sighed and moaned round the house all through the night but it hadn’t blown the snow away and we didn’t have much in the way of drifts which was a relief. After a quiet morning, having coffee with our neighbour Liz and laying in a fresh supply of milk and potatoes, I went out to see if I could turn our snow laden hedges into castle walls…. It wasn’t very successful. To make it work at all, I would have to leave a layer of snow on top of the hedge under each cut and that seemed like more hard work than it was worth. …with no siskins or greenfinches at all. 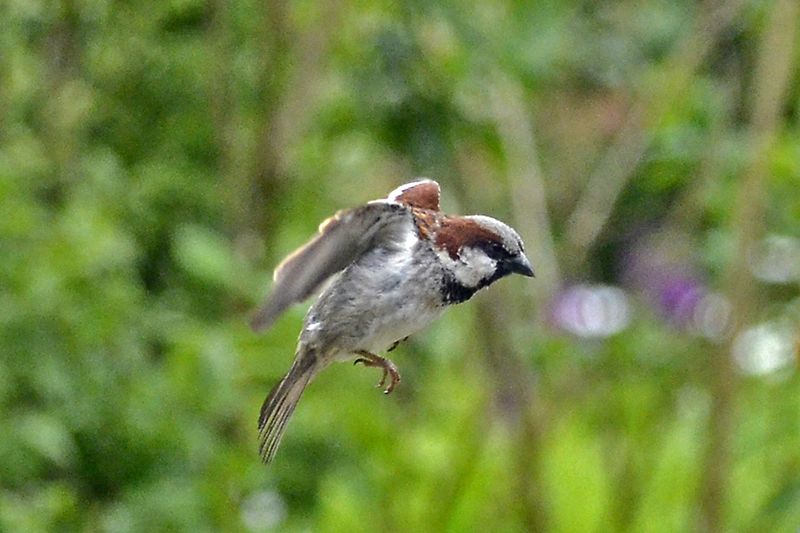 …and the ground below to robin and dunnock. The chaffinches didn’t appreciate being left alone and showed a regrettable tendency to kick each other. I liked the rather grand operatic feel of this little battle. After lunch, I had to go to a volunteers’ meeting at the Welcome to Langholm office and took a small diversion on my way home. In John Street, the natives were clearing ice off the road. Where the cars had compacted the snow, it was so hard that Big Dave was using a pick axe to loosen it before shovelling it away. For once it didn’t start snowing as soon as I went for a walk…. ….but the wind made it the coldest day of the present spell by far. Because I didn’t have my big camera and lens with me, the sky was full of gulls circling above my head. ..whether it had got some heat about it or whether it was just the added moisture that it retained, I couldn’t say. Nearby, a bigger patch had thrown off the snow and was looking very happy. The most outstanding feature of the walk was the number of icicles above my head as I walked through the town. Two views of Henry Street. Oddly, only one side of the street had icicles. There were one or two that I made sure I didn’t step under. On a wall near our house, I saw this sheet of ice…. …and having seen a sheet of ice on Venetia’s blog describing a visit to Bedford NH, I took a closer look with my camera set to video record. She had seen tadpoles under her ice and sure enough, there were tadpoles under this one too. I was grateful to Venetia because if it hadn’t been for her blog, I would never have given this sheet a second look. I thought that the tadpoles were fascinating. It was rather a gloomy day with no break in the clouds and a chilly wind so I was glad to get back home and I didn’t go out again. At least the cold weather means that I am getting some hymn singing practice in. The flying bird of the day is a female chaffinch. It is not the sharpest picture that I have ever taken but it is one of the most elegant. Today’s picture comes from my friend Bruce who saw a horse in a field across a canal. We will get closer to it tomorrow. We had another near freezing but sunny day today and it was most frustrating. I have hardly done any cycling this month, what with bad weather and a long and irritating cold so I have been hoping to put a mile or two in before December comes. Thus I spent a lot of today anxiously looking at the thermometer and frozen puddles in the drive, hoping that the thermometer would rise and the puddles melt. Neither happened and the thermometer stayed stuck at 4°C and the puddle stayed frozen. I am very aware of being a great deal more fragile than I was ten years ago when 4° would have been an invitation to go out for a pedal and a gentle fall wouldn’t have been too serious. I have fallen off more than once in ice and snow but time passes and joints and bones are not what they were so I have become risk averse. 99% of a trip might be ice free but that 1%, a shady corner on a damp stretch under the trees, might be just enough to spoil things. …and then went for a short walk before lunch to give things a chance to warm up. …but the larches on the bank behind it are almost at their very last gasp. In the absence of leaves, I looked at branches…. …and walked up the track onto the lower slopes of Warbla from where I could see a few views for a small amount of climbing. Where the sun hadn’t reached, the frost remained and reminded me of why I wasn’t out on my bike. If I had a serious mountain bike, winter riding would be more possible but I don’t have one and skinny tyres make ice a threat. After lunch, I looked hopefully at the thermometer again and then went for another short walk in a rather grumpy state of mind. ….I walked along the Kilngreen beside the Ewes Water…. …and communed with the ducks. Mr Grumpy saw me and decamped to the opposite bank of the river. …and I caught the eye of a sheep. I was on the same bank as Mr Grumpy now. He looked ready to flit back to the other side at a moment’s notice so I left him alone and walked on…. …under the trees and into the sun. …and found myself in the shadow of our hills as I walked up the river Esk to the Jubilee Bridge so that the only sunlight was now in the branches of the trees above my head. The temperature was already dropping when I got home but where the sun had struck the soil in our garden, it had made it soft enough for Mrs Tootlepedal to plant a few more tulips and I spiked some of the middle lawn. As the light faded, Eric, a fellow member of the Langholm choir tenor section, turned up and we had a useful practice together. Christmas concerts are looming up and all the practice that we can get in is useful. The day rather fizzled out after that and in spite of the two walks and the singing practice, I was left with the strong feeling that it had been wasted. As the next two days are forecast to be sunny but even colder, I fear that any dream of cycling miles in November will have to be abandoned. There is always the gym…..aaaargh!. 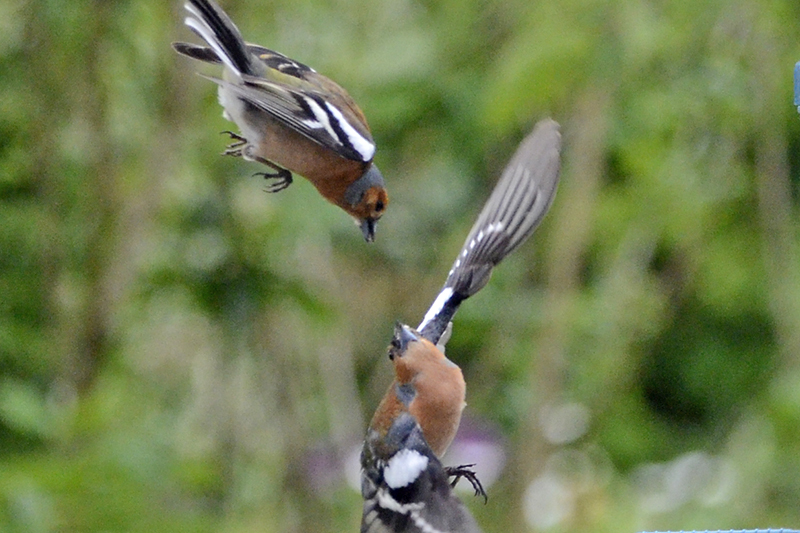 The flying bird of the day is a chaffinch, caught at a busy moment on the feeder. Today’s guest picture comes from my Somerset correspondent, Venetia. She has been volunteering at the Somerset Rural Life Museum and was struck by the enormous crop of windfalls from the apple trees there. The sheep seems rather disappointed with them. After the brilliantly clear moon when we went to bed last night, we weren’t surprised to wake up to a chilly morning. There was no frost by the time that we looked out but early risers tell us that there had been some, although the temperature did not drop to zero. At 5°C (40°F) it was a bit too chilly for cycling after breakfast so I lazed about doing the crossword while Mrs Tootlepedal went off for coffee with her ex work colleagues. I stirred my stumps in the end and went out to see whether the cold had done any harm in the garden. It was a beautifully sunny morning and the poppies looked at their best. A nasturtium leaf caught my eye too. I put on my walking shoes and went for a walk. A goosander showed off her elegant orange feet as I walked along the river bank. …and then I walked down the road to Whitshiels. I had enough time to take a short diversion up the track through the woods before setting off back home. …and there were other things of interest too. 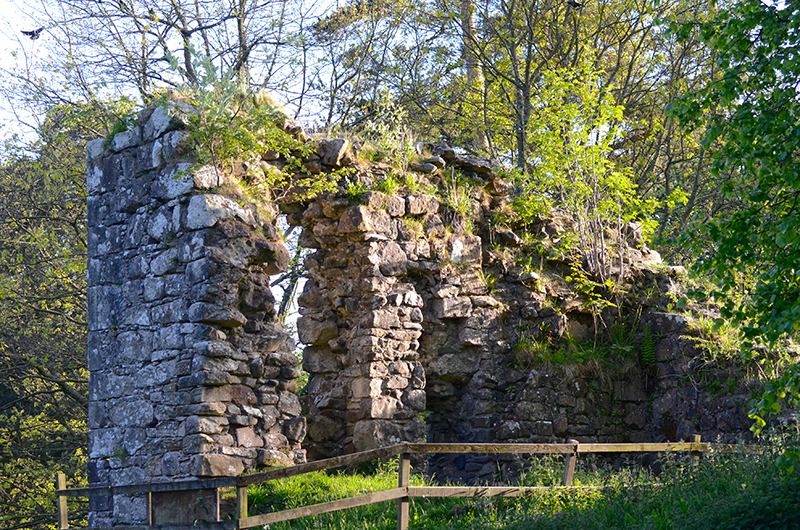 On my way home, I stopped at the Sawmill Brig, which I thought was looking at its best…. …and then walked round the Castleholm, passing the castle on my way. There is not much of the castle remaining but what is left is getting engulfed by vegetation. If I looked carefully, I could see some autumn colour here and there…. …and there was a patch of moss on a gate post which pleased me. 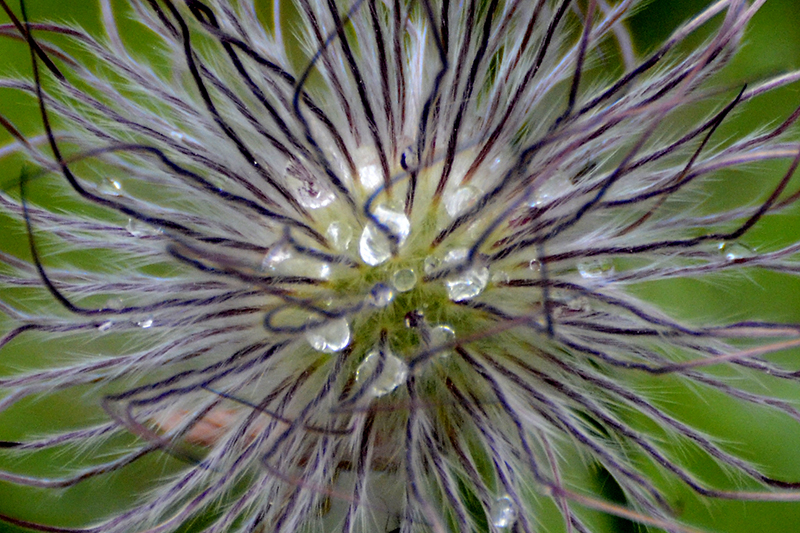 When I got home, I had time to admire a clematis in the garden…. It was laughing at the morning frost. …before Mrs Tootlepedal and I got into the car and drove off to have lunch at The Hub in Eskdalemuir. This had been arranged earlier in the day on a bit of a whim but the drive was delightful and the lunch and the company we met there were very enjoyable so we felt that this had been a whim well worth whimming. I even got the bridge beside The Hub to add to my collection. Because of the good conversation over lunch and a visit to the art exhibition there, we spent more time in The Hub than we had expected and we drove back with no time to stop and admire the views. Mrs Tootlepedal was anxious to get out and do some guddling in the garden and I was anxious to get my bike washed and cleaned and then put a few miles in while it wasn’t raining. Sadly, the sun had disappeared by this time but it was warm enough at 11° for cycling and gardening with appropriate clothing. Because of the late start caused by the time spent cleaning my bike, I kept my head down and did 30 miles without stopping for pictures on the way. It was so grey by now that I wasn’t much tempted to stop anyway, other than for a nibble of guava and half a date every now and again. Mrs Tootlepedal had been very busy while I was out and she had made a start on the path to go with the new square corner on the lawn. Only people who have laid paving stones on earth will know how much skill and effort goes into making them straight and flat. Even on a grey evening, the last of the fuchsias to come out this year was looking superb. In the evening, Mike and Alison came round for a short visit. They are getting ready to go on holiday tomorrow but I was pleased that they found time to come as Alison and I had a very enjoyable time playing sonatas with a burst of Greensleeves to a Ground to round things off. This has been the second day running without rain. We are being spoiled. Today’s guest picture comes from my son Tony who has been experimenting with my old Lumix which I gave to him on Thursday. This is his ‘flying birds’ taken at none o’clock in the evening..
We had a really lovely day today with a cool underlying temperature (17° C at its hottest) and wall to wall sunshine. For me, this is just perfect as I don’t like it when it gets too hot. I had to take some Archive Group heritage disks up to the Welcome to Langholm office in the morning so I took my camera with me and walked back by way of the Kilngreen and the new path round the Castleholm. It was pure pleasure to be and about on such a day. 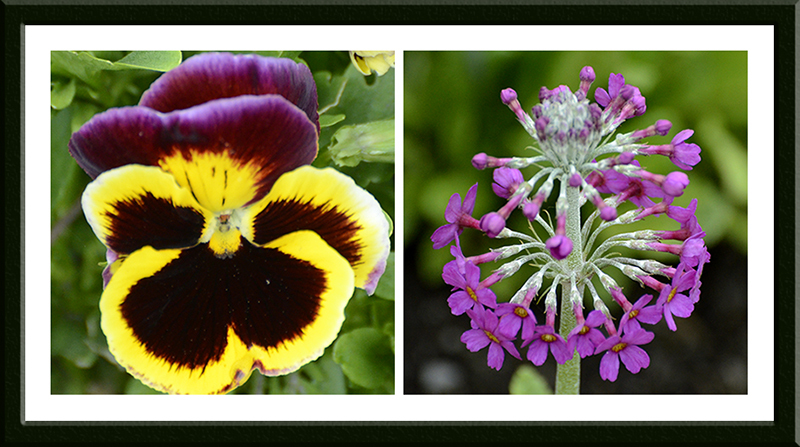 I took a couple of pictures in the garden before I left…. …and enjoyed my extended walk back from the town. I stopped to have a look at the two noble firs at the corner of the path as they are always interesting. They were more interesting than usual today, I thought. One of the pair was covered in more cones than I have ever seen before. The other had no cones at all but the remains of many flowers. 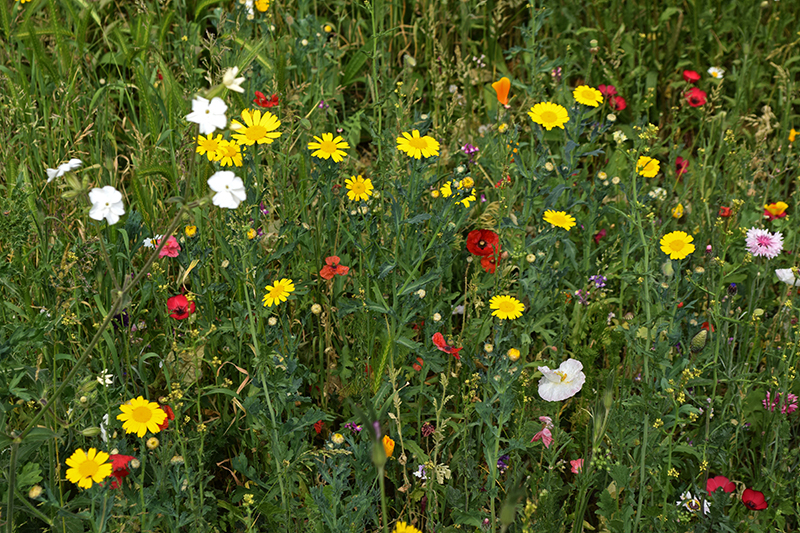 I walked on, passing wild flowers…. ….and hearing odd sounds in the distance. When I had crossed the Jubilee Bridge…. The river Esk seen from the bridge. The trees make an impressive canyon for it to run through. …who were entertaining a crowd of parents and children which had gathered for a junior cricket event. 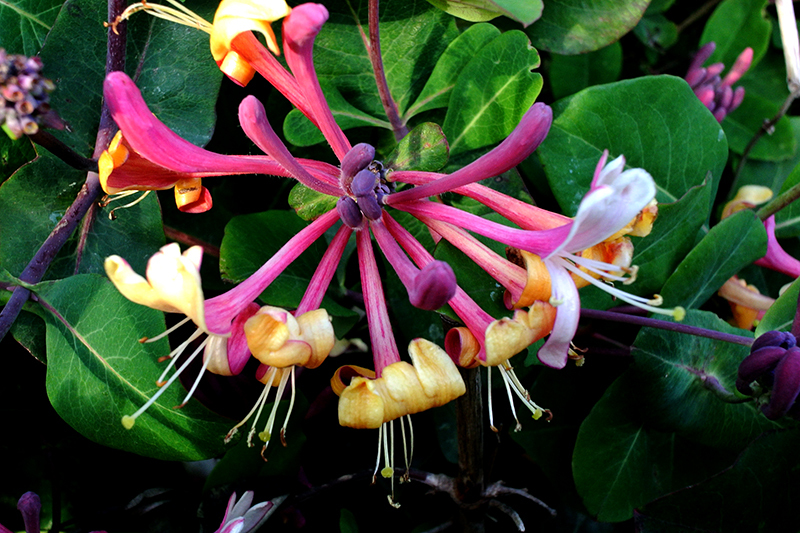 …along with a flower doing aerobics and a fly not flying. 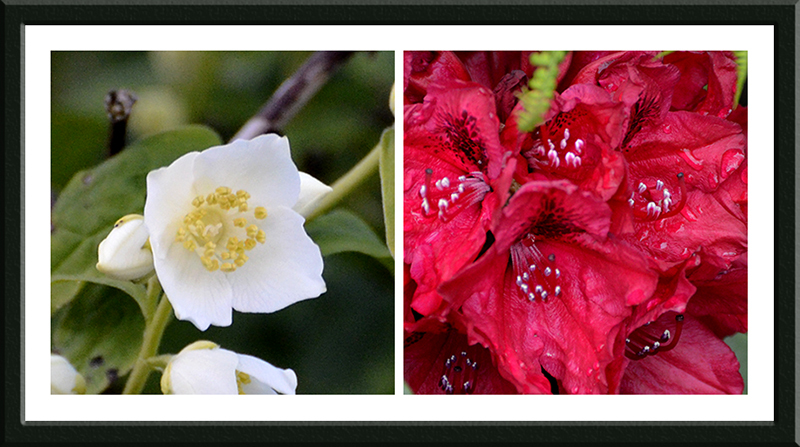 When I got back to the garden, I considered the down side from a lawn maintenance point of view of having a very prolific Philadelphus near the lawn…. 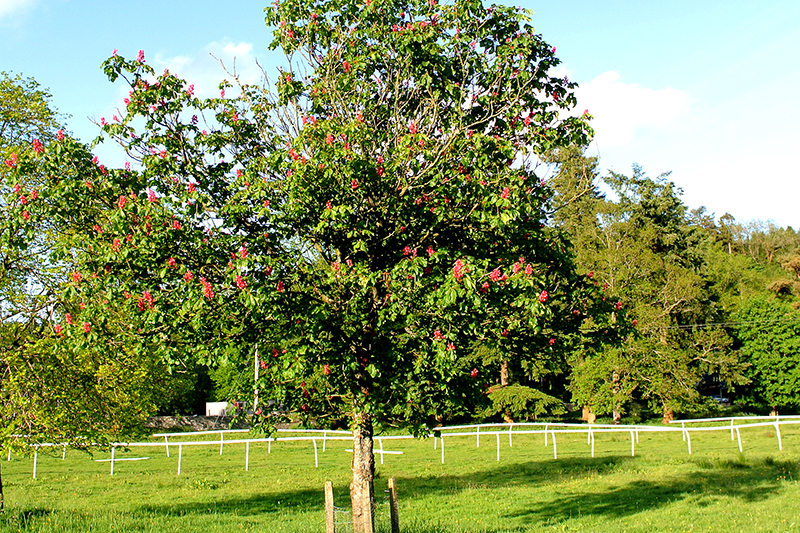 …and then stopped moaning to myself and enjoyed combining clearing up the petals with mowing the lawn. When I had finished the lawn, I turned compost Bin B into compost C.
Then Mrs Tootlepedal came out to give her new secateurs a test. The secateurs come with a special sharpening stone of their own and every part is replaceable individually. They are Swiss made and are well worth the 600 mile round trip to get them. I was allowed a go and can report that they are as smooth as butter in operation. 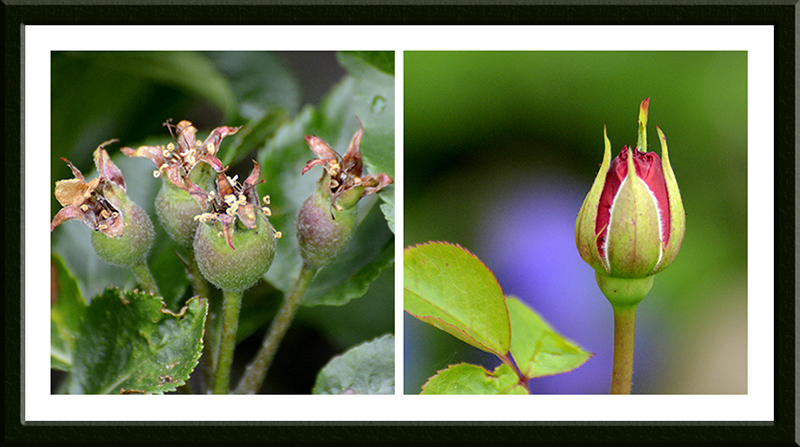 There are always roses to look at at present so I looked at some. …and was just going in for lunch when Mrs Tootlepedal spotted a butterfly. I was doubly pleased to see this small tortoiseshell, not just because it is always good to see a butterfly but also because the small tortoiseshells are said to be getting rather scarce. After lunch, we went off to Carlisle. Mrs Tootlepedal did some very good quality shopping (including dates, prunes, tea, coffee and cheese) while I went to a pub and did some unofficial bonding with a group of the basses and tenors from our Carlisle choir. This involved beer and conversation and while I had very little beer, I did have a lot of conversation. The bonding was the idea of one of the basses as the choir doesn’t meet in the summer months and a very good idea it was. The odd thing about the affair was that on a beautiful sunny Saturday afternoon, most of Carlisle seemed to think that packing into a pub was the best thing to do and the place was full to bursting. I had thought that we might be the only people to be in there on such a good day to be outside. When I left after a couple of hours to go home with Mrs Tootlepedal, the rest of the bonders were still there chatting away merrily. Once home, I thought of a cycle ride but the call of the compost was too strong and I finished the compost turning by putting the contents of Bin A into Bin B. The new demountable wooden compost bins make this a very easy task but I was happy to have got the job finished. The compost in Bin A was really quite hot in the centre of the heap and I hope it doesn’t get so hot in Bin B that it sets fire to the bin. That would be a tragedy. Checked out a bee on a hosta flower…. …and went in to enjoy some fishcakes, with new potatoes and turnips from the garden, for my tea. Altogether a very satisfactory day. Here are two sitting Kilngreen ducks for the flying bird of the day slot today. Today’s guest picture comes from Venetia, my Somerset correspondent, who has been touring the wonderful shops to be found in Glastonbury. She had to step back a little when this book illustration flew at her. We woke to a different world this morning. The soggy green had been covered up by a sparkling frost and the change was chilly but very welcome. While Mrs Tootlepedal went off to sing in the church choir, I made a venison stew for the slow cooker and enjoyed looking at a new perspective from the kitchen window…and an infrequent visitor too. A brambling came to see what was going on. There was quite a lot going on for the brambling to see. I spent quite a bit of time trying to get a shot where all the perches were busy at the same time but there was always at least one annoying bird popping from one perch to another so I didn’t manage it. I noticed some other birds while I was trying. The robin still looking for the perfect Christmas card pose. A greenfinch just posing for the fun of it. It was such a crisp morning that when I had got the stew safely in the slow cooker, I took NewCam out for a walk. I was hoping to see some ducks on the Kilngreen but something else on the river caught my eye instead. Some of them were having fun going down a small rapid…. …and some were having fun going back up it again. A member of the group told me that they were having their annual winter paddle. I was staggered to see that some of them were braving the sub zero conditions with bare hands…. …and I asked the helpful member if there was some benefit from this but she just said, “They’re crackers.” I found it hard to disagree. These must be very hard men. They did have some minders watching over them. I left them paddling off under the town bridge on their trip to Canonbie, six miles downstream…. …and walked over the Sawmill Brig onto the Castleholm. 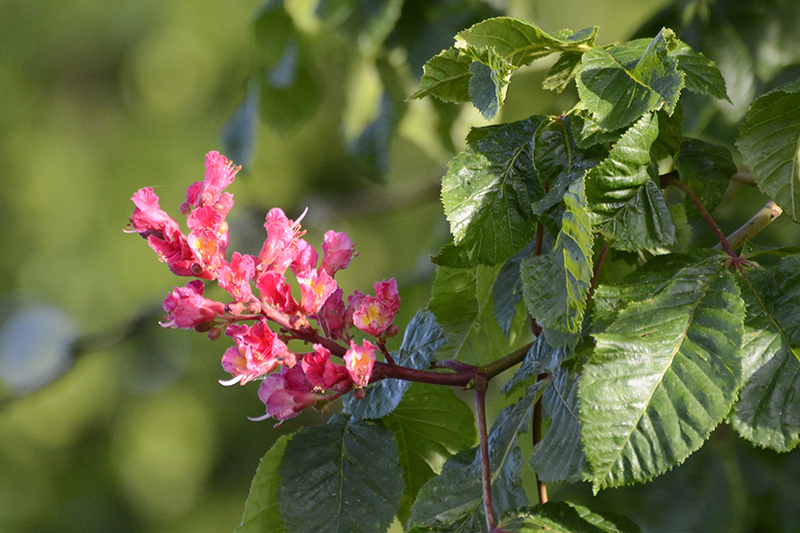 …but as I got near the Jubilee Bridge, I saw an unexpectedly bright flash of colour. This was just the moment to pull out the zoom on NewCam and it showed me that I was looking at a bullfinch. There was another not far away but even NewCam couldn’t bring it close enough to shoot. …and I was quite pleased to get back to the warmth of the house. The rest of the day was spent going to Carlisle to rehearse and then sing with the Carlisle Community Choir. On this occasion, the audience considerably outnumbered the choir, no doubt because a primary school choir was invited to sing some songs during the programme and a primary school choir always brings a lot of relatives in is wake. The floods had caused us to miss last week’s practice and we felt the loss a bit so we were not as note perfect as we would have liked to have been but our work was well received. All the takings from the concert went to the flood relief fund. All through the concert, there was quite a bit of disturbance in the audience from a crying and noisy child or two and there was a slight feeling of where was Herod when we really needed him? At just over an hour with no interval, the concert was a perfect length for a late Sunday afternoon and by good fortune, the temperature had risen above freezing by the time that we came out so we had a trouble free drive home. The venison stew went down well with some tagliatelle and we were happy to put our feet up and watch some undemanding telly after a hard day. The flying bird of the day is a frosty chaffinch. Talking of wild flowers, today’s guest picture was taken by my daughter Annie in a man made wild flower area in her local park in the middle of London. …but there was plenty of colour to be seen. A new, rather sombre rhododendron has come into flower and at the other end of the scale, the first philadelphus flower of the year made its appearance today. There is potential to be seen as well. It looks as though we should get a bumper apple crop. On the bird feeder front, it was nice to see two chaffinches in balletic mood as they have been very quiet lately. The main business of the day was an afternoon trip to Carlisle to sing in the end of season concert with our Carlisle Community Choir. I am rather ambivalent about singing in concerts as you have all the pleasure during the practices of getting tricky music right and all the danger in concerts of getting it wrong. However, things went pretty well and thanks to the cunning use of a local primary school choir as guest artists, the church where we sang was full and the audience gave every appearance of enjoying our singing. The down side is that we have to wait until September before both our choirs get going again. Mrs Tootlepadal will keep her hand in at the Church choir though. By the time the concert had finished, the sun had come out and it was a beautiful day. Interestingly, to me at least, in spite of the sunshine, the temperature on the car thermometer was exactly ten degrees C less than it was when we drove back from Carlisle on Friday after our cycle ride. It was nice enough or a walk after tea so I strolled down Caroline Street (though I had to put a jacket on for comfort)…. 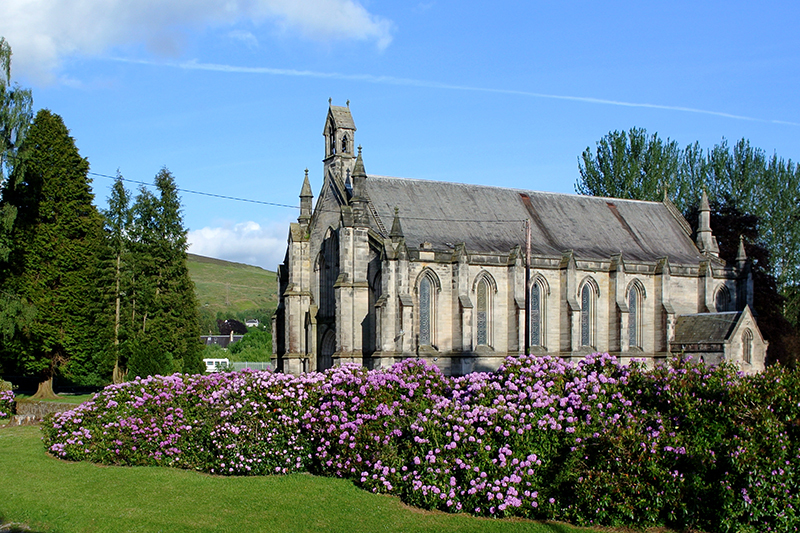 …and round the Kilngreen and Castleholm. A flash of red in a tree caught my eye…..
…but the leaves don’t. Any suggestions? 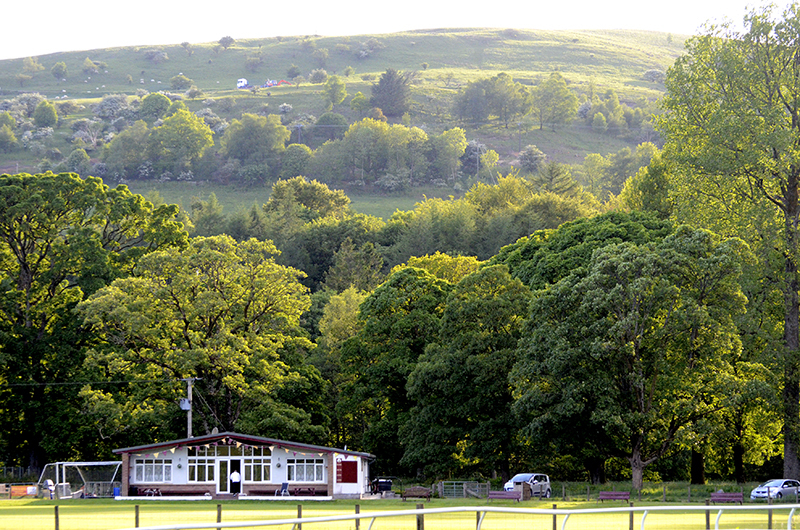 I looked across the cricket pitch towards the clubhouse and the hill behind. 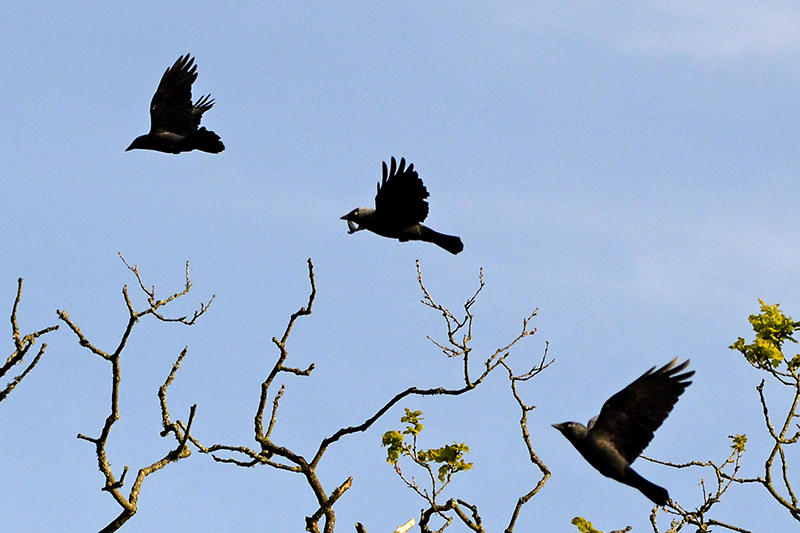 A flock of chattering jackdaws lifted off from a riverside tree as I went past. 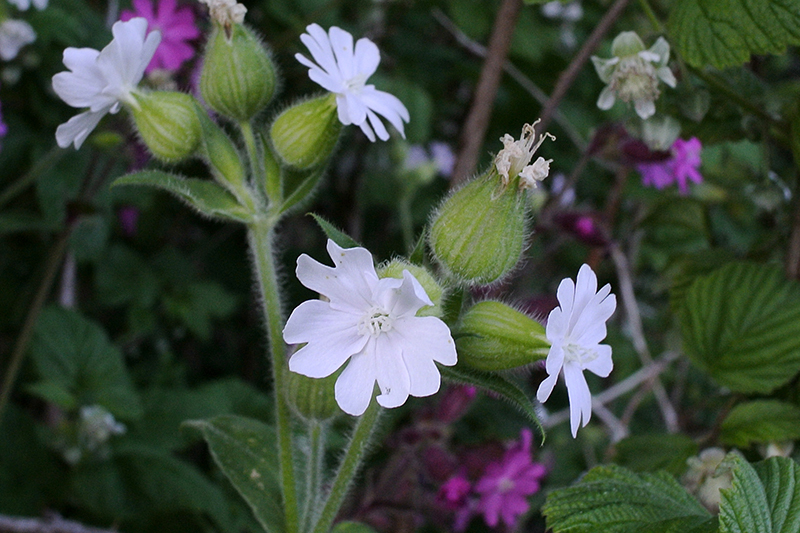 I crossed the Jubilee Bridge and noticed a bright white flower among some red campion. We saw some yesterday too and Mrs Tootlepedal wondered if they were just a white version so of red campion. Once again, I am open to help as I don’t think that they look quite the same. 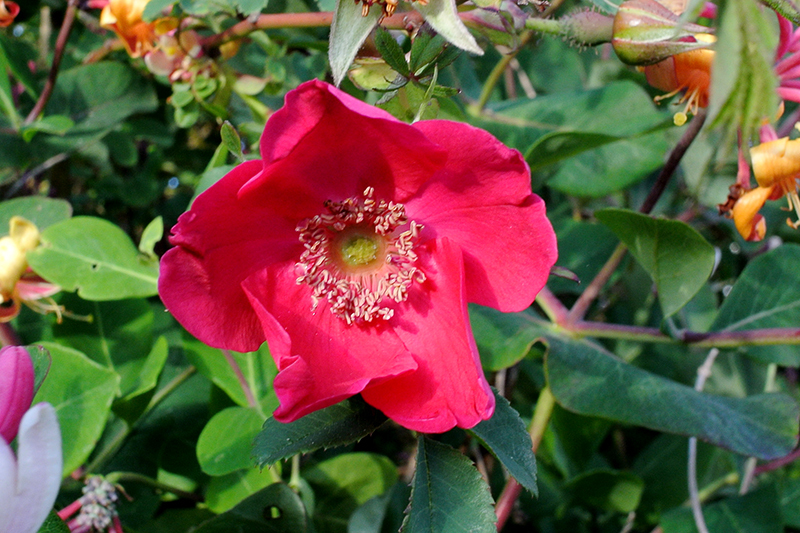 Coming back to the house, I noticed two flowers which are more easily seen from the road than from in the garden at present. Our spell of warm weather seems to have come to an end so I shall look back on the past week with pleasure that I made the most of it both from a cycling point of view and in the garden and because it ended literally on a high note (a top G, the last note of our final piece this afternoon).